When CryptoSlots.com launched earlier this year, a pioneer in the online casino industry as a cryptocurrency only site, it promised to be constantly adding new games to its collection of unique slots and video poker games. True to that promise, CryptoSlots.com has just unveiled its devilish new Blazing Wilds slot. Until August 28, the crypto-casino is adding up to 45% match to players deposits each day for this new slot. Players can deposit using Bitcoins, Bitcoin Cash or Litecoins. When CryptoSlots.com launched earlier this year, a pioneer in the online casino industry as a cryptocurrency only site, it promised to be constantly adding new games to its collection of unique slots and video poker games. 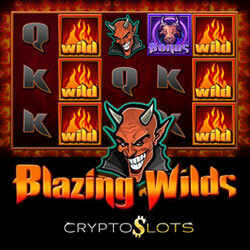 True to that promise, CryptoSlots.com has just unveiled its devilish new Blazing Wilds slot. Until August 28, the crypto-casino is adding up to 45% match to players’ deposits each day. Players can deposit using Bitcoins, Bitcoin Cash or Litecoins. Cryptocurrency deposits and withdrawals at CryptoSlots are fast, easy and secure. Transaction fees are low. Cryptocurrency is instantly converted to US dollars for play. Sign-up at CryptoSlots.com is simple and requires only an email address. Blazing Wilds has an expanding Wild which stacks on the reels for increased wins. In its Free Spins bonus round there are extra fiery Wilds and all wins on the 13th pay line are doubled. Available August 23-28, 2018 only. Valid on Blazing Wilds only. May be claimed once per day. Wagering requirement 37X. 35% added to deposits of $251-$400; 45% added to deposits of$401-$600. May be claimed twice per day. Wagering requirement 35X. CryptoSlots now has 23 provably fair slots and video poker games including a million-dollar jackpot game. Jackpot Trigger is played with tokens collected while playing other games and can pay up to $1,000,000 on a single spin. All games can be played on any computer, smartphone or tablet.